As we write everyone around us is making, and breaking, resolutions to lose weight and take better care of themselves. Staying in shape when you work in a sedentary job can be a real challenge. To help us start off 2019 with some workplace habits to support our Workplace Health Silver Award, we spoke to Keith Jacka, Personal Trainer and owner of Fitness Wild Helston for his hints on maintaining, and improving, our physical and mental health, even if we are stuck in front of a screen all day. In this, the first of two blogs, we will look at our physical position, good posture and how to address the issues that arise from sitting down all day. In a follow up blog, Keith helps us investigate hydration and nutrition in a desk-based role. In front of a computer, we’re often in the same position for hours on end. This is often seen as a negative thing, however in some ways this can be a good thing, as our bodies are able to relax, rest and recuperate. If we plan physical activity into our day, like a quick HIIT workout first thing before work, and then simply going for a walk, run, cycle at midday whilst on a lunch break, the time we then find sat in front of the computer is actually rest and recuperation time. Desk jobs receive much negative press in regards to the development of poor posture, this is true however it is important to note that we are not designed to sit rigidly. The first element to address is your desk set up. If you work for a clued-up employer, you have probably already had a desk assessment. If you are self-employed, or work from home, you need to check this for yourself. Check the angle of your head and neck to the screen, the support your chair gives you, the lighting in the room and the position of your mouse. If you are hunched over a laptop at the kitchen table, you are probably not doing it right! Think about how heavy your head is – on its own it could weigh around 5kg. If you’re hunched over at a 45-degree angle, it feels more like 22kg putting even greater pressure on your neck muscles, discs and spine: Here’s Why the Weight of Your Head is Causing You Problems . Make sure you can see the screen while your head sits comfortably, aligned on top of your neck. This may involve using a laptop stand or separate screen if you don’t have a full desktop and monitor setup. If you want to go into detail you can download the HSE guidance booklet on desk assessments. Once we have a healthy physical position set up, we need to make sure we don’t get stuck in it. Poor posture at a desk all day will take its toll if you ignore it. The good news is that every time you get up, even just to walk to the water cooler, you will reset your position. In our office, we have centralised bins rather than everyone having a wastepaper basket under their desk. This not only helps with the recycling but makes sure we get up and move around. Even without getting up, you can reset. Simple things like setting your shoulders correctly and lifting your head from a forward position to a neutral position for periods of time will help relieve tension around the neck, shoulders and back of the head. Squeezing each bum cheek individually and rotating your pelvis into an anterior/ posterior rotated position will keep the hips active which will ease tension in your lower back. No-one will even see these movements but practicing them, perhaps whilst on a phone call, will help you become more aware of your position and relieve tension and pressure. Think of your body as a set of lights, can you mentally and physically turn on the different switches to get each muscle to light up? You can also look at the sedentary parts of your day and ask if you really do need to be sitting down for all of them. At Forms Plus, we regularly hold stand up meetings. Not only are these better for us, they tend to make sure the meeting keeps on track and happens more quickly, saving time and improving productivity. 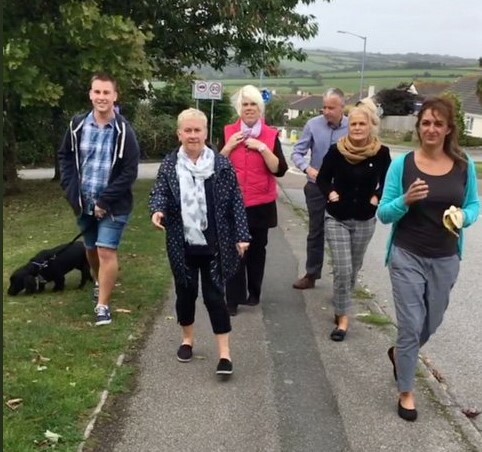 Sometimes if we need a bit longer to discuss an issue, we’ll hold a walking meeting. Going for a walk to work out an approach to a challenge often feels less stressful than sitting around a whiteboard. The fresh air and oxygen flow from walking can help us come up with more creative solutions. Could you try stand up or walking meetings in your office? Keith’s core piece of advice is to plan out your day with plenty of breaks. At school you had lessons of 45-60 minutes, a break in the morning and afternoon and a longer break at lunchtime. This kind of timetable could work well at work too. Break up your day into chunks of no more than a couple of hours and plan what to do in each chunk of time. To be more productive, take the last 15 minutes of each block to tidy up loose ends and plan for the next section. Then take a break. This way when you get back to your desk, you’ll find you’ve had some thinking time in your break and when you get back, you’re ready to go for the next task. Do the same at the end of each day, and you’ll find it easier to get going in the morning. So, we have looked at body position, ways to keep moving and how to plan your day so you don’t end up frozen in front of your screen for too long. Our next blog will look at what else you can do to improve your health in a desk job – including how to fit in work out time around a long work day, commute and perhaps a busy family life. We’ll also take a look at nutrition and hydration to back up and support all the good physical work you’re doing. Let us know how you get on!